Thank you so much for such a detailed reply, RevJames. You answered exactly what I was curious about with respects to the consistency of the Master Root. I’m going to look at the Solomon’s Seal, instead for now. Thanks so much for your help and idea that sounds better. I am search for master root whole. Any idea where to find? Lucky mojo currently only has pieces. We will put whole roots back in stock as soon as our vendors supply them. 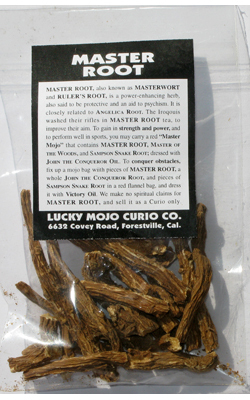 I ordered a master root, which came today. It's so beautiful and strongly scented. My black cat fell in love with it but is content to sit on the envelope it came in and is not bothering the actual root. I'm not quite sure what to do with it -- it was a reward to myself for a task accomplished. One question: are master roots gendered? Do I need to name it a male or a female name? Thanks for all the posts regarding it. Master Root is not gendered, other than by folks who call men "masters" and women "mistresses," i would guess. One use for it is to name it for uyourself and then tie to it the little name-paper strips of those who ought to be bound to your leadership.